As the retail industry changes rapidly, it’s essential to develop and train talented future leaders. Today JLL announced the recipients of its ICSC Foundation’s JLL Diversity Scholarship, which in partnership with the International Council of Shopping Centers (ICSC), provides financial assistance to two minority undergraduates studying real estate or a related field at Georgia State University and The University of Georgia. 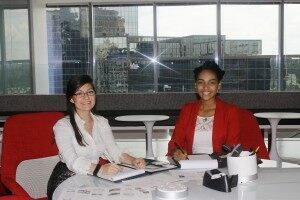 The winners, Sofia Mendoza of Georgia State University and Alexis Robinson of The University of Georgia, will also intern this summer with the firm’s retail group at its Atlanta headquarters. The JLL Diversity Scholarship aims not only to educate up-and-coming all-stars in the industry, but also mentor them through an intensive, summer-long, internship program. Both Sofia and Alexis have excelled in the classroom, their communities and extra-curricular activities and are a breath of fresh air for the retail industry. – Kristin Mueller, COO of JLL’s Retail Group. Sofia Mendoza: was born in Mexico City and has lived in the state of Georgia for 12 years. She is currently a rising senior at Georgia State University, Robinson College of Business majoring with a B.A. in Real Estate, and is preparing to obtain her real estate license this upcoming fall. She is currently President of the Real Estate Club at GSU, a member of ICSC and has recently become a member of CREW’s (Commercial Real Estate for Women) Atlanta chapter. For the duration of her internship she will be assisting with research, business development, specialty leasing and department specific assignments. Aside from academics, Sofia enjoys staying active with Zumba, Salsa dancing, running, swimming, meditating, and attending cultural events, especially if food is involved. “I am having the experience of a lifetime, working with JLL’s Retail team. I have been welcomed into a culture of team work, positivity, and strategic thinking and I’m looking forward to putting all my learnings from Georgia State University to work during my time at the firm,” said Mendoza. Alexis Robinson: was born and raised in Pittsburgh, Pennsylvania before she relocated to metro Atlanta. She is currently a rising junior at The University of Georgia, double majoring in accounting and real estate. During her internship at JLL she’s tasked with assisting on vendor contracts, leasing agreements and research. This is the second consecutive year that JLL’s Diversity Scholarship has helped fund the ICSC Foundation’s scholarship program through an annual donation, and the firm was the first company to offer an internship to scholarship recipients.